View Our Monthly Newsletter - January 2016 ~ The Toronto Hare Krishna Temple! 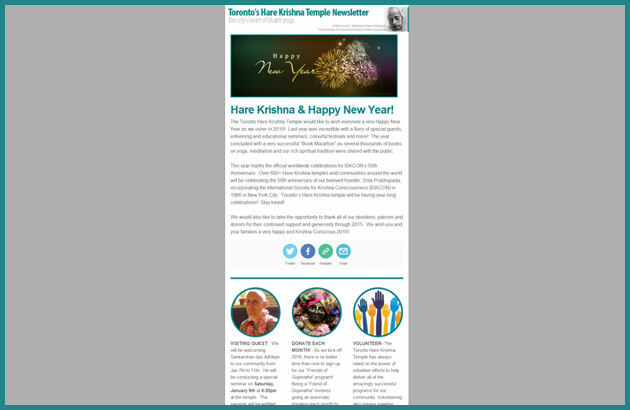 The Toronto Hare Krishna Temple has been sending e-newsletters out for a few years now. One of our goal's for 2016 is to become a little more regular and send out a newsletter at the beginning of each month, updating readers about upcoming and ongoing programs at the temple. With that, we are happy to share our January edition of our monthly newsletter! Special thanks to Thulasi Sathianathan , one of our active young devotees, for taking the lead on the monthly newsletter project. Click the image below (or click here) to open the January 2016 newsletter.